I have a limited supply of walking sticks that have tiny surface imperfections. 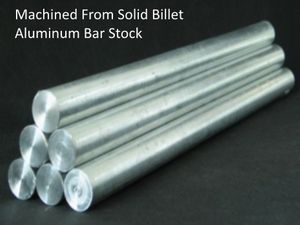 They are NOT used and may have a slight surface finish variation from shaft to handle. In other words, the handle will be shinier than the shaft. It's not much of a difference and happens because the parts are anodized at different times. It may have an over-buff mark, tiny ding, scratch, scar, spots, or other very small surface imperfection. These blemishes in no way affect the strength or structure of the cane. 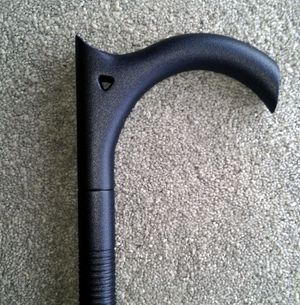 Here is a good deal on a structurally sound, very strong, solid aluminum walking cane. I call them blemished because there is a slight finish variation between the handles and the shaft. The shafts are not as shiney as the handles, and the handle or the shaft might have a tiny scratch, ding, spot, or overbuff that is hardly noticeable. The cane parts are handled many times during manufacturing and some of them get marked. I get these finish variations when the parts are anodized at different times. They are structurally perfect and strong, and the same as any of my walking sticks in every other way. They will have a tiny blemish, spot, ding, scratch from handling. 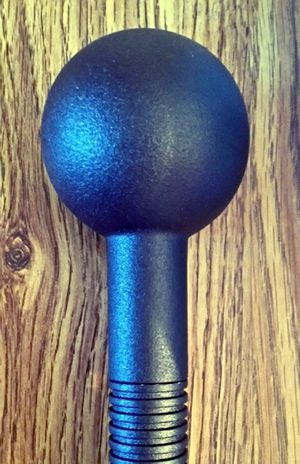 Don't wait if you want the finest quality solid aluminum walking stick available anywhere for the best price ever ! All of our canes are solid aluminum made from solid billet bar stock and have two sections of grooves, top and bottom, for gripping. They have a continuous, machine taper from top to bottom. They are not cheap hollow tubes without a taper. The process of machine tapering a walking cane on a lathe is much more expensive than simply extruding a hollow tube, and the appearance is outstanding compared to a simple, straight hollow cane. We machine them the right way, for strength and a lifetime of quality! DO YOU WANT THE KNOB HANDLE, THE EDGED C HANDLE OR THE REGULAR C HANDLE?